If you'll pardon the pun, comedy is a funny thing. Standup comedy, in particular, doesn't age very well. 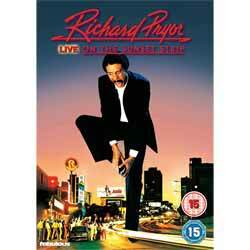 Richard Pryor was a pioneer in his field. His observations were dry and honest and Live on Sunset Strip was one of the funniest live videos when it was released in 1982. Now...? Not so much. The problem is comedy of this style is constantly evolving and several generations of comics have come along since, many of whom were inspired by Pryor - or inspired by other comics who were inspired by Pryor. Over the course of the live act he tackles several subjects, but it's his frank discussion of his drug addiction and his public downfall after freebasing cocaine in 1980 that probably hits home the hardest. But I have to honestly admit that I barely cracked a smile watching this release, let alone laughed out loud. What was funny then, is not so funny now. When you can watch this for free online, or purchase older editions for under £2 online, I'm struggling to fathom why anyone would pay for this new release on DVD.